The epicentre of the Mekong Delta, Can Tho is the largest city in the region and feels like a metropolis after a few days exploring the backwaters. It’s just as the political, economic, cultural and transportation centre of the Mekong Delta, it’s a buzzing town with a lively waterfront lined with sculpted gardens and an attractive blend of narrow backstreets and wide boulevards. It is also the excellent base for nearby floating markets, the major draw for tourists who come here to boat along the many canals and rivers leading out of town. (32 D Hai Ba Trung; 6am-8pm) In a fantastic location facing the Can Tho River and decorated with huge incense coils, this Chinese temple is set inside the Guangzhou Assembly Hall (Ð Hai Ba Trung). It is the most attractive religious destination in town. It was originally founded in the late 19th century to worship Kuang Kung, a deity symbolising loyalty, justice, reason, intelligence, honour and courage, among other merits. Approaching the engraved screen, the right side is devoted to the Goddess of Fortune and the left side is reserved for the worship of General Ma Tien. In the centre of the temple is Kuang Kung flanked by the God of Earth and the God of Finance. (1 ƉL Hoa Binh; 8-11am & 2-5pm Tue-Thu, 8-11am & 6.30-9pm Sat & Sun) The large, well-presented Can Tho Museum brings local history to life with manikins and life-size reproductions of buildings, consisting of a Chinese pagoda and a house interior. Displays (with ample English translations) focus on the Khmer and Chinese communities, plant and fish specimens, rice production and, inevitably, the American War. (36 ÐL Hoa Binh; 8am-5pm) This pagoda was originally constructed in 1946 to serve Can Tho’s Khmer community. The ornamentation is typical of Khmer Theravada Buddhist pagodas, with none of the multiple Bodhisattvas and Taoist spirits common in Vietnamese Mahayana pagodas. 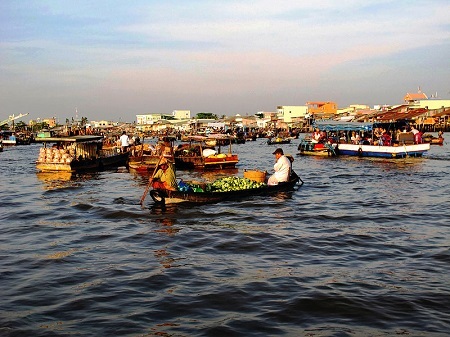 The undisputed highlight of any trip to Can Tho is having a boat ride through the canals to a floating market. It costs around US$5 per hour for a small boat, which can carry from two to three travellers. For boat operators (mostly women), just wander along the riverside near the giant statue of Ho Chi Minh. Travellers can also reserve through Can Tho Tourist, but there is may be no negotiation. Larger motorboats can go further afield and it’s worth hiring one to make a tour of the Mekong River itself. Check the going rates at Can Tho Tourist, then see what’s on offer at the pier by the Ninh Kieu hotel. Prices range from 200,000d for a three-hour tour to 350,000d for a five-hour tour. Negotiation is the name of the game. Can Tho boasts the best range of accommodation in the Mekong Delta, so lie back and enjoy. (0907 652 927; http://hotelxoai.com; 93 Ɖ Mau Than; s US$10, d US$14-26, tw US$19) Great value at this warmly, nice hotel with bright, mango-coloured (the hotel name means ‘Mango Hotel’), airy rooms. Staff here speak English fluently and there’s a roof terrace with hammocks. (071-381 7049; www.kimlancantho.com.vn; 138A Ð Nguyen An Ninh; r US$20-48) This very clean minihotel has chic rooms with contemporary furnishings and artworks on the wall. Even the small, windowless US$20 standard rooms are perfectly good , and deluxe rooms are lovely. (071-382 3578; tcdac@yahoo.com; 17 Ð Dien Bien Phu; r US$12) Set down a small lane, this place is popular with budget tour groups thanks to spacious, clean and surprisingly quiet rooms with TVs, fridges and hot showers. (071-376 3959; 118/9/39 Ð Tran Van Kheo; r US$20) This hotel, which is on the same road as the central market, is closer to the bus station in a busy part of the central city. Rooms have big bathrooms and wi-fi. A smart hotel, verging on the boutique, Kim Tho is decked out with attractive fabric furnishings in the foyer. There are many stylish rooms throughout and include nice bathrooms. You can have cheaper rooms on lower floors, but superior rooms have hardwood flooring and the pricier river-view rooms are still a great deal. A rooftop coffee bar on the 12th floor. (071-382 5831; www.saigoncantho.com.vn; 55 Ð Phan Dinh Phung; s 476,000-1,190,000d, 562,000-1,190,000d) This well-kept hotel has a dependable range of good-value rooms. Deluxe rooms are like suites and come along with flat-screen TVs and fruit baskets; there are safety deposit boxe every room. (071-625 2377; www.ninhkieuhotel.com; 3 ÐL Hoa Binh; r 777,000-1,097,000d) This large hotel has clean, comfortable rooms with handsome furnishings. The windowless, cheaper rooms are pleasantly furnished with a minute corner bath. Superior rooms might have windows facing the interior coutryard, so check first. The lobby is a study in Vietnamese glam, with big chandeliers, marble tiles and a neon sign over reception. (071-381 9139; www.nambocantho.com; 1 Ɖ Ngo Quyen; r from US$140) Presiding over a mere seven suites in a colonial-era building, this amazing riverfront hotel revels in traditional presentation and contemporary elegance, even though service can be quite flat. Good restaurants on the top floor, and at ground level. (071-381 0111; www.victoriahotels.asia; Cai Khe Ward; r US$91-230, ste US$277-310) With very good service, this hotel has its own style and sophistication in the Mekong Delta. Designed with a French colonial look, the rooms – along with romantic corridors – are set around an inviting pool which looks out over the river. Facilities include a good restaurant, an open-air bar and a riverside spa. There are many activities on offer, for example cycling tours, cooking classes and cruises on the Lady Hau, a converted rice barge. Tourists to some Mekong provinces may be surprised to find Khmer towns whose inhabitants speak a different language, follow a different brand of Buddhism and have a vastly different history and culture to their Vietnamese neighbours. Even though the Khmer are a minority in the Mekong, they were the first people living here, with an ancestry dating back more than 2000 years. Kampuchea Krom (meaning ‘Lower Cambodia’) is the unofficial Khmer name for the Mekong Delta region, whose indigenous inhabitants are the Khmer Krom, an ethnic minority living in southern Vietnam. The Khmer Krom trace their origins back to the 1st century AD, to the founding of Funan, a maritime empire that stretched from the Malay Peninsula to the Mekong. Archaeologists think Funan was a sophisticated society which constructed canals, traded in precious metals and had a high level of political organisation as well as agricultural know-how. Following the Funan came the Chenla empire (630–802 AD) and then the Khmer empire, the mightiest in Southeast Asia, which saw the creation of Angkor Wat among other great achievements. By the 17th century, yet, the empire was in ruins, under pressure from the expansionist Thais and Vietnamese. This was when power for the Vietnamese empire was risen, which started expanding south, conquering first the Cham empire before setting their sights on Khmer lands in the Mekong Delta. According to some historians, 40,000 Khmer families were living around Prey Nokor as the Vietnamese arrived in the 1600s, following the granting of settlement rights by King Chey Chettha in 1623. Prey Nokor, which was an important port for the Cambodian kingdom, was renamed Saigon in 1698. A large number of Vietnamese settlers populated the city as other colonists continued south. There were 700 Khmer temples scattered around south Vietnam prior to their arrival. During next century the Khmer Krom fought and won some small victories in the region, expelling the intruders, only to lose their gains in new rounds of attacks.